Aerodynamicists use wind tunnels to test models of proposed aircraft and engine components. During a test, the model is placed in the test section of the tunnel and air is made to flow past the model. Various types of tests can be run in a wind tunnel. Some tests are performed to directly measure the aerodynamic forces and moments on the model. The most basic type of instrument used in this type of testing is the force balance. We must measure six components, three forces (lift, drag, and side) and three moments (pitch, roll, and yaw), to completely describe the conditions on the model. For some tests, only three components (lift, drag, and pitch) are measured. On this page, we will discuss an idealized measurement of the three forces and three moments of a six-component balance. 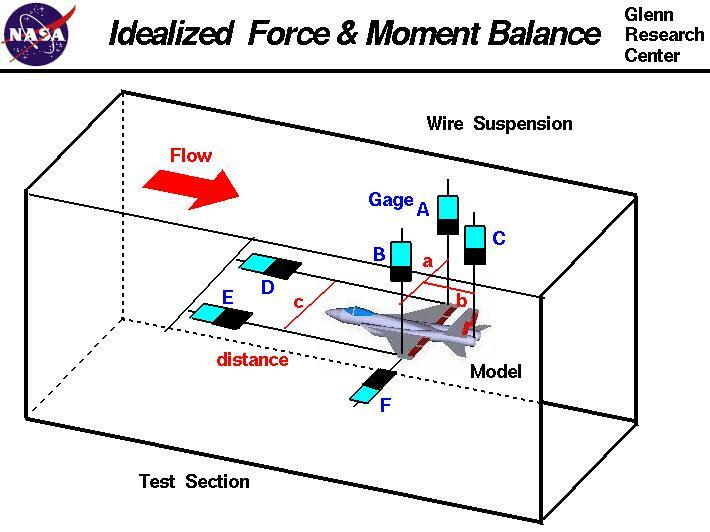 As shown in the figure, an idealized fighter plane model is suspended by wires from the ceiling of the wind tunnel. In reality, there are several different ways to mount a model in the test section, and the measuring devices may be located inside the model, or on a measuring platform outside the tunnel. The choice of location for the measuring devices and the type of mount affects the data reduction for the model. In this idealization, there are six gages labeled A through F, that keep the model correctly oriented inside the tunnel. The gages could be electronic strain gages that measures a force by the stretching of an electrical element in the gage and an application of Ohm's law to the change in electrical resistance of the element. Or the gages could be simple, mechanical spring gages that measure the force by the stretching of a spring. A test is conducted in the following manner. With the tunnel turned off and no air passing through the test section, the weight (W) of the model is determined as the sum of the forces from gages A, B, and C. The tunnel is then turned on and air flows over the model. The model generates aerodynamic forces and moments that changes the readings on the strain gages. This mounting system is an idealization and the components must be kept perpendicular to one another to give the proper measurements. For instance, if the model moves downstream when the wind is applied, then the A, B, and C gages will be measuring some portion of the drag force in addition to the lift force. This complication explains why most wind tunnel mounting systems involve rigid tubes and not suspension wires.